"I think the market had been pretty heavily leaning toward a continuation of weak (Canadian) data and strong U.S. data when they were thrown a complete curveball," said Michael Goshko, corporate risk manager at Western Union Business Solutions. "Given the fact that we had just made a one-and-a-half year high the previous day (for USD-CAD), I think the market was pretty long (U.S.) dollars." 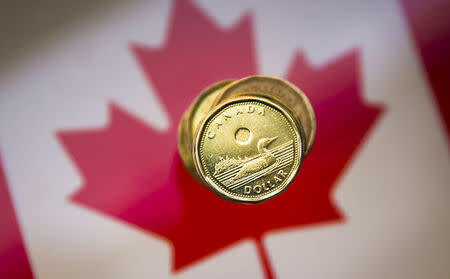 At 4:00 p.m. (2100 GMT), the Canadian dollar was trading 0.5 percent higher at 1.3312 to the greenback, or 75.12 U.S. cents. The currency traded in a range of 1.3285 to 1.3400. On Thursday, Bank of Canada Governor Stephen Poloz said the economy was weaker than forecast and predicted that lower prices for oil, one of Canada's major exports, would cut growth. But the price of oil rallied on Friday after major oil producers agreed to reduce output. U.S. crude oil futures settled 2.2 percent higher at $52.61 a barrel. Canadian government bond prices were mixed across a flatter yield curve, with the two-year down 2 Canadian cents to yield 2.002 percent and the 10-year rising 18 Canadian cents to yield 2.071 percent. The gap between Canada's two-year yield and its U.S. equivalent narrowed by 5 basis points to a spread of 71.7 basis points in favor of the U.S. bond.